The real name of Mevlana is Mohamed Celaleddin. Both Mevlana and Rumi are the names that were given to him later. The name Mevlana that means “Our Master” was given him at a young age when he started studying in Konya. People like Sems-i Tebrizi, Sultan Veled and everybody who liked him, started using the name Mevlana; a name that became a symbol. Mevlana’s birth place is an old big Turkish cultural city Belh, now located within the borders of Afganistan. His date of birth is 30th of September 1207. Mevlana belonged to a noble family; His mother was Mumine Hatun, the daughter of Belh Emiri Rukneddin. His grandmother Melike-i Cihan Emetullah Sultan was a Turkish princess from the Harezmsahlar dynasty (1157 Easrtern Turkish Kingdom). His father was known as Sultanu'l-Ulema (The Sultan of the Worlds). In 1222 Sultanul-Ulema and his family came to Karaman and stayed here for 7 years. In these years most part of the Anatolia was under the control of Seljuk State. Konya was the capital of this state. Konya was decorated with artworks, and was full of scientists and artists. In short, Seljuk State was on its peak of success and was ruled by Alaeddin Keykubad. Alaeddin Keykubad Sultanu’l-Ulema invited Bahaeddin Veled from Karaman and asked them to settle in Konya. Bahaeddin Veled accepted Sultan’s invitation. In 3rd of March 1228 Bahaeddin Veled came to Konya together with his family and friends. Sultan Alaeddin greeted them with a great ceremony and assigned the Altunapa (Iplikci) Madrasah to their use. Sultanu’l Ulema died in 12th of January, 1231 in Konya. After the death of Sultanu’l Ulema, his students and followers gathered around Mevlana and considered him as a sole successor of his father. Mevlana indeed has become a great scientist and religious scholar and started giving speeches in Iplikci Madrasah. Mevlana met Sems-I Tebrizi on 15th of November, 1244. However, this didn’t last long because, Sems suddenly died. 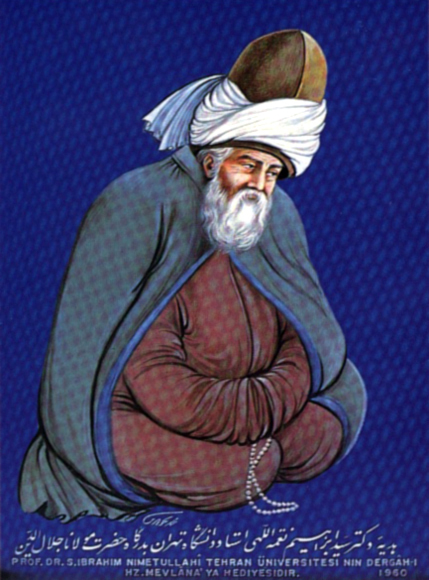 Mevlana who described his life as "Hamdiım, pistim, yandım" died in 17th of December, 1273 on Sunday. Mevlana accepted death not as an end but, as a rebirth. When he was going to die he was going to return to the One he loved the most, to Allah. This is why Mevlana called his death night as “Seb-i Arus” that means the night that has to be celebrated as the wedding night and asked his friends not to cry too much after he dies. Mevlana also left many important works. Among those his Mesnevi has a special place. Mesnevi is a name of a poetry style in classic eastern literature. Literally, it means “double, in doubles”. In literature it is a name of a verse where every couplet has its separate rhyme written in the same rhythm. Mevlana wrote the Mesnevi as a request of Celebi Husameddin. The language of Mesnevi is Persian. There are 25618 couplets in the oldest available Mesnevi copy written in 1278 that is still being exhibited in the Mevlana Museum. Mevlana describes his Islamic mysticism thoughts and ideas in the form of short stories in this six copy Mesnevi. Divan-i Kebir means “Great Book” or “Great collection of Poems”. Mevlana’s poems written on numerous topics are all in this big collection. Although the language of the Divan-i Kebir is Persian, there are few poems that are written in Turkish, Arabic and Greek languages. Divan-i Kebir is made of 21 smaller collections and Rubai collection. There are over 40.000 couplets in Divan-i Kebir. Because Mevlana wrote some of the poems in Divan-i Kebir with Sems Pseudonym, this collection is also known as Divan-I Sems. Mektubat is composed of 147 letters written as a counsel to the important leaders of his time and Seljuk leaders who sought his opinion and interpretations on various important topics. In these letters Mevlana didn’t follow the literary rules and wrote exactly as he spoke. He never used such words as “your slave, servant” in his letters. With the exception of the rank and official position names, he always addressed the person to whom the letter was written according to the intelligence, knowledge of religion and the good things done by that person. Fihi Ma Fih means “His inner is inside him”. This work is the sum of the speeches made my Mevlana on various occasions and was collected by his son Sultan Veled. It has 61 chapters. Some of these chapters include speeches that were addressed directly to Seljuk Vizier Suleyman Pervane. Since the work also refers to certain political events of that time, it is also considered as a historical source. Topics like hell and heavens, life and afterlife, guru and a follower, love and heaven are also discussed in this work. Mecâlis-i Seb'a (Seven Assemblies) as the name implies is the collection of his seven sermons told in seven different assemblies. Mevlana’s sermons were recoreded by Celebi Husameddin or his son Sultan Veled and some notes were added later provided that it didn’t change the original text. Both during his life and after his death Mevlana was loved by many people from different races and religions and had many followers in many countries. Many great western intellectuals and philosophers like German Poet Goethe were deeply affected by his thoughts and ideas. Nowadays, people who adopt and follow Mevlana’s philosophy join in cultural and brotherhood understandings. After Mevlana’s death, Mevlevilik was institutionalized as a religious order by his son Sultan Veled. One of the most important rituals of Mevlevilik is sema. Sema that is made of 7 parts symbolizes a spiritual journey towards the perfection (Mirac), a going and coming back. Each part has its own meaning. According to the scientific explanation of Sema, the fundamental condition for existence is rotation. The common similarity of everything that exists, from the smallest particles to the stars on the sky, continue their existence by rotating. Even atoms, the smallest building blocks of matter are made up of a nucleus with electrons rotating around it. In the universe, all planets rotate around their own axis as well as around the stars and the galaxies made of these stars also rotate around each other. Mevlevis believe that all these beings rotate because they loose themselves in their love to Allah and give a meaning to their existence by remembering and extolling Allah. Indeed, there are evidences for this in Koran. It is said in the 17th chapter ‘The Children of Israel’, 44th Verse of the Koran that, “The seven heavens declare His glory and the earth (too), and those who are in them; and there is not a single thing but glorifies Him with His praise, but you do not understand their glorification”. Atoms that make up our body rotate and blood circulates in our body just as everything else in this universe. A human comes from and goes back to earth and rotates together with the earth whether he wants in or not. But, these are unconscious rotation. One thing that separates humans from the animals is the intelligence. A semazen (whirling dervish) rotates and joins to the rest of the rotating space objects but, he also uses his mind during this rotation. Therefore, the sema ceremony that symbolizes becoming one with the universe and tending towards the truth, glorifying with mind and love, leaving your own personality and earthly temptation and dissolving in Lord and returning back to His service as a complete and spiritually mature human is not a performance but, a religious ceremony. It is a returning to the love and service with a new spirit and new creation. By removing his cardigan a semazen is regenerated in an eternal world where he continues his journey. The coin on his head is the gravestone of his essence and the tennure that he wears is the shroud of his essence. By locking his arms crosswise they symbolize the number ONE, the unity of Allah. Thus semzen, while rotating with open arms, points his right arm upwards like a prayer and his left arm points downwards. Thus he reflects the gifts that he receives from Lord to the people. And by rotating from right to left around his heart, he embraces all people and all creations with love and compassion of his heart. Because Mevlevis believe that music elevates the soul, takes it to the upper worlds and helps us to hear the music coming behind the gates of heavens, music was also added to the ceremony. People who play musical instruments like nay and kudum during the ceremonies in sema houses form a group called “Mutrip”. Musical work that is played in Mevlevi houses during the sema ceremonies are written by Mevlevi composers and called “Mevlevi ayin”. The main parts of these works are being composed from the poems in Persian taken from Mevlana’s Mesnevi or Divan-i Kebir. This music along with assuming a very important function in Turkish Music is also a work that has very well preserved the attributes of the SUFI music style. Sema and semazens played an important role in the development of the Ottoman Divan Culture. They had a very strong influence and contribution to the divan poetry, calligraphy and visual arts of the period between 14th and 20th century. To mark the 800th anniversary of Mevlana, UNESCO declared and approved 2007 as “The Year of Mevlana” in all countries. Appear as you are or be as you appear. No matter how much you know, you can only explain as much as the listener can understand. Direct advice will hurt a person. Everybody can give food to anybody but, only Allah can forgive it. I’ve seen many people with no clothes on them and I’ve seen many clothes with to people in them. It is stupid to agree with everything but, it is also wildness to say wrong to everything. Adopt our character, get used to us, not to others. Once you enter Sema, you’ll be out of both worlds. This world of Sema is outside of both worlds. If you have intelligence, be friends with other minds too and act with their consultation. When minds join, lights become brighter and a path becomes clear. But, when the cravings of the flesh join, the darkness falls and the path disappears. We will seed nothing but love to this earth, this clean field. Don’t be like a single drop, make yourself a sea. If you miss the sea, stop being a drop. Don’t envy to others’ happiness. There are many people who envy to your life. The roses that grow in gardens fade and die out, roses that grow in our hearts are constant. The dirt inside you cannot be washed by water; it can only be washed by tears. To feel sorrow for a tiger with sharp teeth is unfairness to sheep. First get rid of mice and then start growing wheat. There are many devils with human faces, shouldn’t give hand to every person. It is always crowded around the sweet waters. The biggest idol is the idol of cravings of the body. The cravings of our body is a thorn with three sides, it will prickle no matter how you put it. You have to give everything that has to be given before the death takes everything that was given to you. Mind, love and heart. This triangle is a cure of all and heal of all wounds. The one who looks for a perfect friend will be left will no friend. If you want to know a person, look at the people with whom he is hanging out. Searching for something that isn’t there is like not searching at all. A hand cannot do anything without the knowledge of the heart. A candle will not lose anything by lighting another candle. There is nothing surprising about a wolf wanting to eat a lamb. The surprising thing is that this lamb has fallen in love with the wolf and gave him his heart. Every troubled person has home full of darkness and mist. If you hear is pain, you will open a window in that house. If your thoughts are like rose then you are like a rose garden. If your thoughts are thorns they you are thorny. It is a disgrace for a lion to steal his neighbor’s prey but, for dogs it isn’t. The world is a worthless toy for a scholar and a precious swing for a fool. For a donkey, there is no difference between a bead and a pearl. That donkey doubts the existence of a pearl and a sea anyway. Nobody hides the sugar from a donkey but, a donkey still eats the grass because of his nature. Carcass is a disgusting thing for us but, for a dog and a pig it is sweeter than sugar. A raven screams like a raven in the garden. But, would a nightingale stop singing because of that? The filthy ones do their filthy things but, waters always try to wash it. The one who grows a rose from thorn is also turning winter into summer. The one who glorifies the love can also turn the sadness into cheer. An endless sea will never get dirty from a mouth of one dog and the sun will never fade from blowing. Hey brother! You are going against a sharp sword. Don’t forget to take your shield of repentance and adoration. The horse of repentance is a truly amazing horse. It can take a man from the very bottoms to heavens in one instant. Don’t let the broken mother-of-pearl make you sad, there is a pearl inside it. Knowledge is like an endless sea and the one who seeks knowledge is like a diver in that sea. If the clouds didn’t cry, how would greenery smile? Nightingales are kept in cages because their voices are loved. But, who will put a raven or an owl in a cage? Close you eyes with your fingers, can you see anything? If your eyes are closed, it doesn’t mean that the world doesn’t exist. What is gold, what is soul, and what is pear and coral if they are not being spent for love, being sacrificed for love? So many fools in this world would pay bunches of gold to buy a trouble from the devil. A person with dissonant heart, know that this temporary world is just a dream. In order to say a word, you have to hear and listen first. You also start be listening to a word. The one who worships his body cannot save himself. Don’t be without love in order not to be dead. Die with love to stay alive. If you don’t have a friend, why aren’t you looking for one? If you found a friend, why aren’t you happy? You can be thrown into fire on the path to the Lord. But, before going into fire check well if you have Ibrahim in yourself, because, the fire knows and doesn’t burn only Ibrahims. Sometimes a meaning in one glance cannot be expressed with words. Sometimes one glance is a healing and sometimes a poisonous arrow. How much more of this robbery? How much longer of this war? Why so much resistance? Why? Why light is running from a light? Why? We are one mature man all together, only one. Why are we confused so much? Why do rich look down on poor? Why right is looking down on its left? While both of them are your arms, both of them. What is blessed and what is unblessed? Come says the Greatest of the Great! And you are a soul, you fly. You are in love and you start sema. Where is that path of love to beauty? Here is immortality, here is freedom. For how long are we going to fill our pockets with stones, earth and crocks? In our hands and under arms, for how much longer? They all have the same oil. But, break the doors and pitchers first! Like the waters that take the same path. Don’t look for me in either of these worlds. OUR SCREAM IS HEARD BEYOND THE BORDERS ANYWAYS!